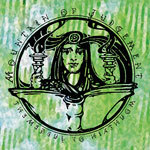 MOUNTAIN OF JUDGEMENT started as the brainchild of Chad Davis, known as an anchor man in various North Carolina heavy underground bands/projects of the 90’s and 00’s – most notably Seven Foot Spleen (1994-1998), Subklinik (1995-present), U.S. CHRISTMAS (2004-2009), Hour Of 13 (2006-present), Romannis Motte (2006-), Agrabatti (2009-), Tasha-Yar (2009-) and others. «It was February 2003. Three guys – Dave, Scott C. and Chad – arrived with guitars, weed, amps, weed, a bass, more amps, weed, drums, a P.A. and… weed. Then, another man – Scott I. – arrived with a few synthesizers and weed. Then, it was into a rehearsal room with liquid light projectors, incense and pipes. The sound was slow, loud and spaced out… Mountain Of Judgement was created. A mix of modern day heavy music and latter day psychedelia, MOJ crafted a sound unlike most things of their time. 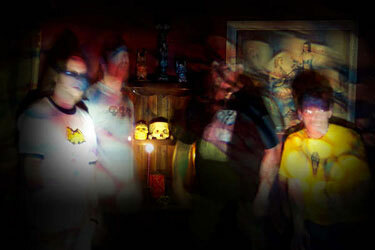 Psychedelic Doom was a pinned description. Quite a few recordings were made. And quite a bit of weed was smoked… But, as time would have it, the band did call it quits due to other commitments,» Chad said. Follow MOUNTAIN OF JUDGEMENT at Facebook. The original MOJ line-up of Scott Cline (bass), Dave Easter (drums), Scott Isenhour (synthesizers) and Chad Davis (vox, guitar, synthesizer) started recording this album in 2005. However, the work was left unfinished that time due to Davis’ commitment to U.S. CHRISTMAS. In 2009, soon after this partnership came to an end, Chad resumed recording the MOUNTAIN OF JUDGEMENT album. Many arrangements were rewritten, and many parts including the drums were completely rerecorded by Chad himself. Synth on one track was contributed by Matt Johnson of USX. This eponymous release which also includes two bonus-tracks from the original 2005-sessions (three songs, in fact, with brutally raw vintage sounding) is not your average doom-metal album. Apart from solemn, crushingly subsonic guitar riffs and heavy stomping rhythms, it is filled with dizzying synthesizer washes and swirls while the vocal parts sound very close to mystical transmissions from outer worlds or dimensions. MOJ’s "true psychedelic doom" still stands the test of time and offers an exhilarating experience to lovers of the deviant doom-metal and heaviest psyche-space-rock. (8 tracks - 65 min.). Free streaming or immediate digital download of the album (in your choice of MP3-320, FLAC, or just about any other format) is available through Official R.A.I.G. Bandcamp. "It's a shame that this is the one and only release we're going to get from Mountain Of Judgement. One can only hope that if this album garners enough attention then perhaps Davis will see to it that the phoenix will rise out of the ashes for another go round. I don't know, call me crazy but I think when a band like this clearly demonstrates that they're capable of delivering music that is this powerful and captivating, then that music not only needs to be heard, but it's also essential that it continues as well. (Score: 4/5)" – by Ryan Sparks at Sea Of Tranquility (USA) (February 2010). "The intro to the opening song 'Neptunes Reign' lays it all out, with sweeping nebulous synths soaring over crushing stoned sludge metal, the riffs huge and droning, the drummer bashing out slow-motion elephantine beats, the zoned-out vocals sung in a chant-like cadence. If it sounds like these guys are evoking a heavy Sleep vibe, you'd be correct. Much of this disc reminds me of early Sleep, and fans of the stoner metal gods will probably dig Mountain Of Judgement's take on this sound. This is much more spacey and acid-fried, though; while the pounding gooey lava-lamp metal grinds through massive Sabbathian depths, those synthesizers are way out in front, splattering the sludge with endless black hole drones, whooshing lift-off fx, and deep-space oscillations. These guys wear their love for classic 70's space rock proudly on their sleeves, particularly drawing from the music of Hawkwind and Ash Ra. 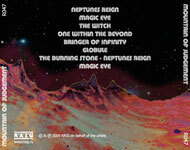 Throughout the disc, the metal will often drift away and be replaced by long stretches of moody psychedelic jamming and swathes of pure fx freakery, and when the crushing Sab-riffage re-emerges, it's joined with soaring clean vocals (that can give this a classic heavy metal vibe) and some killer wailing psych-guitar freakouts. And the song 'Globule' is a standout, a crushing, surprisingly catchy chunk of space-pop-sludge. And much like how U.S. Christmas sometimes blends their Southern rock influences into their driving space rock, there's a bit of Southern booziness that can be heard in Mountain Of Judgement's sound, too. You can definitely hear it on the last track 'Magic Eye', where, for just a second, the band enters a zone where they sound remarkably like Electric Wiz covering something by Lynyrd Synyrd. Their hefty psych-doom owes a lot to their influences, but their combination of kosimiche freakout and narcotized doom is one of the better ones that I've heard. It's like hearing Sleep jamming with Dik Mik and Klaus Schulze, or Electric Wizard with the mysticism and space rock worship cranked to the max and the darkness turned down a bit, their controls set for some distant interstellar destiny instead of black oblivion. Recommended to fans of the aforementioned bands looking for their next fix of blasted drug-sludge." – by Adam Wright-Carmean at Crucial Blast (USA) (August 2010). The album was also reviewed at: Metal Library (Russia), Metal Library's interview with Chad Davis (Russia) - an English version is available through Doommantia (USA), DisAgreement (Luxembourg), Concrete Web (Belgium), Doom-metal.com (UK), Psychotropic Zone (Finland), Metal Library (2) (Russia), It Sounds Awesome! (Russia), Doommabestia (Italy).